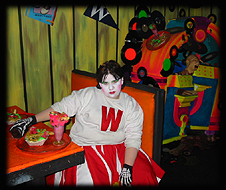 In browsing our “Through the Years” section of Ultimatehaunt.com, you may run into a prior maze named “Toon Terroritory”. 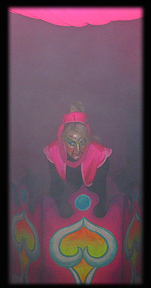 You will find some pictures of that fun maze and our prior synopsis of the attraction. 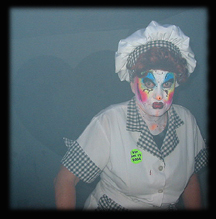 Here, for the 2004 Halloween Haunt, Terror Vision’s angle is not that far away from Toon Terroritory. It’s the same basic idea…instead of television cartoons gone bad, here it’s television sitcoms and other shows. I Scream of Jeannie, the Fraidy Bunch, Wheel of Misfortune are a a couple of the scenes twisted around in the maze. 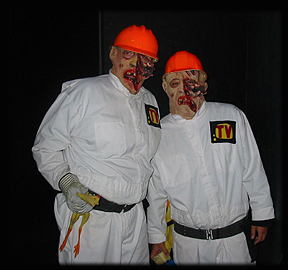 We felt that the beginning and ending of the maze carried an interesting concept: Plainly the static from the television set and the characters were undead-type television repair personnel. The idea set the tone for what guests were about to enter. Once guests entered through the television static area, the adventure really began. 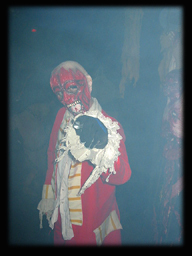 Now, unfortunately, visitors of the Halloween Haunt who have been attending for several years have seen a maze incredibly similar to Terror Vision however, if you’re a new fan of the event, you were in for a real treat. After several years now of utilizing the chromodepth 3D effect, Knott’s Scary Farm has begun to truly take advantage of how it’s done. The 3D fx were fantastic in this maze! The maze was set up in the middle of the construction zone for the Silver Bullet rollercoaster. The entrance was located inside of the Swamp area, by the Indian Trails area. Another fantastic example of Knott’s Berry Farm taking advantage of the space they have at the park. 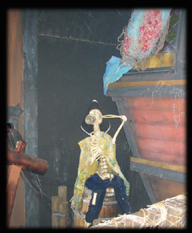 There certainly was a lot of build up for this maze prior to the 2004 Halloween Haunt season starting up. We’ll just cut right to the chase. 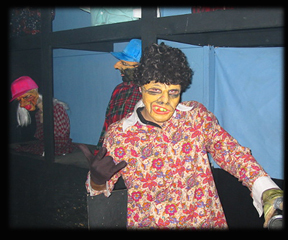 Some of the talent of the maze was incredible while others were literally non-existant. 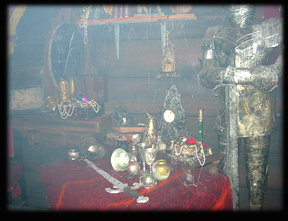 There is no denying however, that the sets for this maze are some of the most detailed designs that we have ever seen at Knott’s Scary Farm Halloween Haunt. The set up for the maze was very unique in that some of the maze took place outside, in the front of the park. 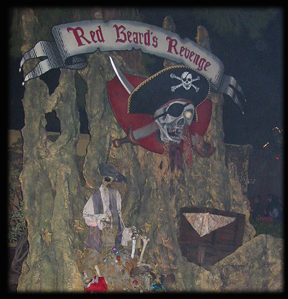 Located near the entrance of Camp Snoopy, Red Beard’s Revenge was a killer look into the world of pirates and true example of how Knott’s maze designers can pack a punch with the sets. 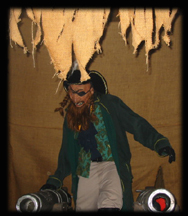 After walking through an old town, complete with pirate wenches, guests entered into a pirate ship (again, we have seen this in prior years in the Ultimatehaunt.com Through the Years section. Locate our Revenge of the Dead information). The amazing thing about the inside of the ship was that it was actually rocking back and forth! The effect was a little subtle but if noticed, every cool! The attention to detail was certainly our favorite aspect of this maze. Everywhere you turned there was more and more eye candy. It will be awesome to see what is added to this maze in the future. In fact, several parts of the maze have been left up all year at Knott’s Berry Farm! If you are at the park and walking through Camp Snoopy, you’ll see bits of shredded pirate flags, etc. above some of the walls. 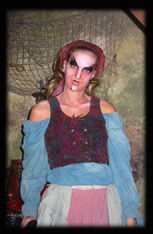 This maze is definitely a classic already and one of the greatly decorated attractions in Haunt history.